Washington (AFP) – President Donald Trump warned Venezuela on Wednesday that “all options” are on the table and demanded that far left leader, Nicolas Maduro, unblock US aid shipments to the country. 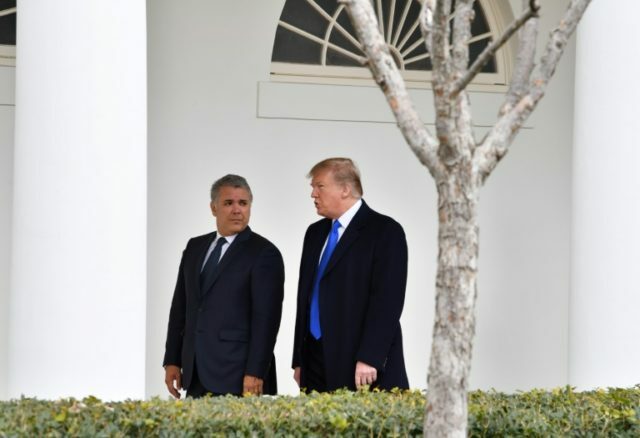 Again stressing that he had not ruled out military options, Trump said he was “sad” about the “turmoil” in the oil-rich Latin American nation. “You’ll see,” he told reporters at a White House meeting with his Colombian counterpart Ivan Duque, when asked if thousands of US troops could deploy. However, much of Venezuela’s population is in desperate need, lacking even basics like food and medicine. “I think he’s making a terrible mistake by not allowing that to happen,” Trump said of Maduro’s refusal to allow in the aid. At a huge opposition rally on Tuesday, Guaido vowed that humanitarian aid would enter the country on February 23. “We have almost 300,000 Venezuelans who will die if the aid doesn’t enter,” he added. Guaido’s team has also met with Brazilian officials to set up a second aid storage center on that border. The new right-wing government of President Jair Bolsonaro in Brazil, which took over in January after more than a decade of leftist rule there, has joined the growing coalition against Maduro. Venezuela has the world’s biggest oil reserves but its once thriving economy has fallen into ruin under the long-running leftist government. Some 2.3 million people have fled since 2015, their salaries and savings rendered worthless by hyperinflation.